Irrigation Is Important For The Health Of Your Lawns And Gardens. If you’ve invested money into your landscape, lawns, and gardens, it’s probably important to you that it remains healthy and always looks it’s best. Irrigation systems are necessary if you have large lawn areas, large garden beds, hedge-rows, and ornamental trees as part of your landscape. Why Do You Need Irrigation Services? Do you need to install a new irrigation or lawn sprinkler system? Do you have an existing irrigation system you’d like to upgrade? Do you want to control your irrigation system from your smart phone? Are you looking to schedule some routine maintenance for your irrigation system? Is your irrigation or sprinkler system broken and in need of repair? Green Acres Lawn & Landscape is a licensed and insured Kansas City landscaping company that specializes in irrigation and lawn sprinkler systems. Whether you need a few new irrigation zones installed for a new lawn or garden bed, some maintenance, or repairs, our irrigation specialists will be able to help you ensure your lawn and garden areas receive the right amount of water on a regular basis. Are you planning on installing a new lawn or building new garden areas on your property? We specialize in the design and installation of automated irrigation and lawn sprinkler systems using the latest in irrigation technology. When we view your property we carefully determine your landscape coverage needs and the watering needs of your specific plantings to come up with “irrigation zones”. Your irrigation zones are carefully planned out to deliver the right amount of water in the areas where it’s needed the most. For example this ensures that Zone A (or Zone 1) is going to receive X amount of water and Zone B (Zone 2) is only going to receive Y amount of water and there could be many zones depending on the complexity of your yard and landscaping and every zone might have very specific watering needs. The establishing of your irrigation zones allows your sprinkler system to discharge precise amounts of water depending on the particular needs of that section of your property. We setup an automated, digital controller that takes care of all of the water distribution, and the scheduled times of day automatically for a trouble and worry free installation. If you have an older irrigation system that isn’t working correctly, you’ve added new lawn or garden areas, or you’d like to take advantage of more modern irrigation and water saving technology then upgrading an older irrigation system is a good option. Why Do You Want To Upgrade Your Irrigation? Are your sprinkler heads not popping up correctly? Are your sprinkler heads no longer turning properly? Do you want to make your system more water efficient? Do you want to take advantage of “smart” irrigation technology? Are your irrigation valves stuck or worn out? We specialize in upgrading and retrofitting older irrigation systems with more modern equipment including new sprinkler heads and new digital irrigation controllers. In many cases the underground piping is still in good condition so we focus on replacing the sprinkler heads and installing a new controller. Have you discovered a leak in your lawn sprinkler or irrigation system? Do you have broken sprinkler heads? Is your irrigation controller no longer working correctly? We specialize in troubleshooting and repairing many different types of irrigation problems. There are a number of unqualified irrigation companies providing irrigation and lawn sprinkler services to customers throughout Kansas City but when your irrigation contractor decides to cut corners, you likely won’t know about them because it’s underground and you can’t see it. A poorly installed or configured irrigation system is going to cost you money down the road. Whether your system is no longer working because of poor installation practices or it’s been broken by accident or lack of maintenance we’ll be able to repair your lawn sprinkler system and get it back into good working order. Your irrigation system must be maintenance annually if you want to keep it performing at it’s best and also to prevent any damage to the system. We offer both spring and fall irrigation system maintenance services. 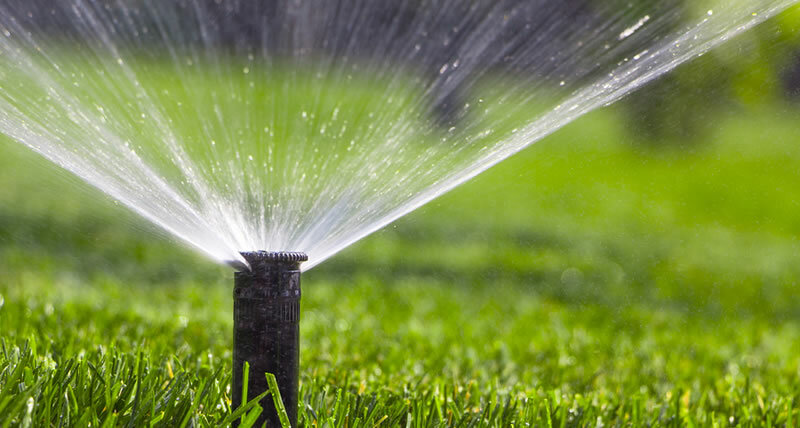 Spring Maintenance: Getting your irrigation system going for spring usually involves an inspection of the system, inspecting all of the sprinkler heads, valves, and the controller. We also make sure the controller is set correctly for your watering needs. After a thorough inspection we can fire up the system and make sure everything is working correctly, repairing any damaged system components on an as-needed basis. Fall Maintenance: As winter creeps closer it’s time to winterize your irrigation system and to do this we usually shut the system down and then blow out the irrigation lines using an industrial air compressor that forces all of remaining water out of the lines. Any water in your irrigation lines can freeze during the winter which results in cracked or broken piping and valves which can be expensive to fix. How Much Does A New Irrigation Or Lawn Sprinkler System Cost? This is one of the most common questions we are asked. It’s pretty much impossible for us to give someone an accurate or even ball park price for their irrigation or lawn sprinkler system installation over the Internet. There are many variables that all factor into our equations when determining job cost so for that reason a site visit and consultation is really the only way to move forward. If you’d like to schedule an estimate for your irrigation system installation, maintenance, upgrades, or repairs please give us a call (913) 422-5111 or fill out our online form and we’ll get right back to you.